Brooke House, a purpose built Boarding House, is home to girls in Years 12 and 13. There is a spacious, comfortable Common Room, where the girls meet and chat over breakfast before school, or discuss their day over supper in the evenings. Occasionally, they’ll tuck into homemade pizzas, or enjoy a takeaway. 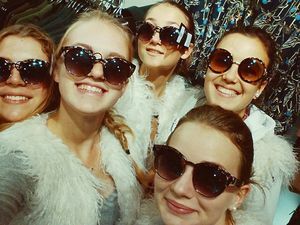 Some girls have their own bedrooms, some with en-suite bathrooms, and girls are encouraged to put their own individual mark on their rooms; photographs of family and friends, posters, fairy lights, their own curtains, rugs and duvet covers. Trips to IKEA and Bluewater provide the perfect opportunity to stock up on those home essentials. Along with the studying there is also plenty of time for fun. On Friday evenings there are activities planned by our elected Head of House and the girls, including Games nights, Quiz nights, or Ten Pin Bowling to name but a few. 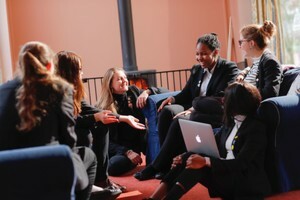 Girls are free to suggest activities, and recent events have included an International dining night, when students cooked dishes from their own country. There are also trips to West End shows, restaurants and the cinema and plenty of time for shopping to local supermarkets, for those who enjoy doing their own cooking, or to the nearby Bluewater Shopping Centre on Saturdays. Our girls are always busy – follow us on Twitter @cobhamboarding to see the pictures. Brooke's Housemistress is Mrs Jackson. She lives in the House along with her husband, Mr Jackson, who helps out in the Maintenance Department and also is a driver on one of the twice daily minibus routes, and their dog Freddie. Read more about Mrs Jackson on our ‘Meet the Housemistresses’ section. "I love the fact that the Sixth Form feels like a family that I will love and cherish forever."